The founder of Less Cancer on his experience. The evening before the National Cancer Prevention Day Workshop is Less Cancer board member Donna Eacho, Less Cancer Founder Bill Couzens, Ambassador Bill Eacho, U.S. 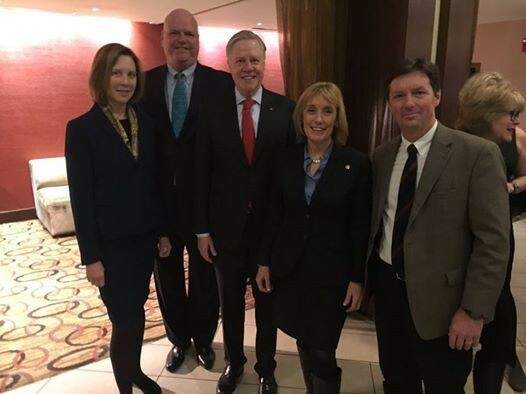 Senator Maggie Hassan and Less Cancer Chairman Tom Sherman, M.D. February 4th marked the 2017 resolution for National Cancer Prevention Day. Activities around “National Cancer Prevention Day” included the United States Congressional Cancer Prevention Caucus. This years caucus met on February 1st. Caucus chair speakers included Representatives Debbie Dingell and Barbara Comstock. The following day, February 2nd was the National Cancer Prevention Day Workshop. Less Cancer raised the bar on programming for the 2017 workshop providing evidenced based continuing education credits for both professionals and students in medicine, nursing, and public health. Collaborations with both the University of Virginia and American University helped to facilitate credits. Legislators speaking at the National Cancer Prevention Day Workshop included Debbie Dingell, Charlie Dent, and Don Beyer. Returning speakers included John Groopman, Ph.D. from the Bloomberg School of Health at Johns Hopkins University. Dr. Groopman was the 2016 Recipient of Less Cancer’s Ronald B. Herberman Speakers Award. Also returning was Janie Heath, the Dean and Warwick Professor of Nursing from the University of Kentucky. Joining us by SKPE this year, was the Ronald B Herberman Speaker Awardee, Dr. Mona Hanna-Attisha a pediatrician and public health advocate who brought attention for the Flint Water Crisis; a tragedy that exposed children to dangerous levels of lead in Flint, Michigan. Dr. Hanna-Attisha was named one of Time Magazine’s 100 most influential people. New speakers included Jann Balmer Ph.D., RN, FACEHP, Chair, Tobacco Free Alliance of Virginia. Less Cancer Leadership Awards went to Katie Horvath, JD, Manager of Cowell Family Cancer Center, Traverse City Michigan and Mindi Messmer, State Representative from New Hampshire. Others included Suzi Tobias, Advocate and Founder, Less Cancer Bike Ride; J. Kim Penberthy, Ph.D., ABPP, Professor of Psychiatry & Neurobehavioral Sciences, University of Virginia; Dyan Aretakis, FNP, MSN, PNP, Project Director, University of Virginia Teen Health Center; Linda Reinstein, Co-founder of the Asbestos Disease Awareness; Kathleen Haden, MSN, RN, ANP, Adult Nurse Practitioner of Surgical Oncology, University of Virginia. Less Cancer Chairman Tom Sherman, M.D. presented on the Seacoast Cancer Cluster in his home state of New Hampshire. Emmy Award Winning Journalist Miles O’Brien moderated the panel on drinking water. Panelists included Mae Wu from the Nation Resource Defense Council and John Scully, Ph.D. Interim Department Chair, Charles Henderson, who is the Chaired Professor of Materials Science and Engineering Co-Director of Center for Electrochemical Science and Engineering from the University of Virginia and Jesse Meiller, PhD, Senior Professorial Lecturer, Environmental Science, American University. Rob Bilott, Less Cancer board member also on the panel, gained fame for his work in PFOAS Perfluorooctanoic acid (PFOA), also known as C8, a synthetic perfluorinated carboxylic acid, and fluorosurfactant. PFOA persists indefinitely in the environment. It is a toxicant and carcinogen. Here is this 2017 take away. As founder of Less Cancer, it has become increasingly and exceedingly clear that the focus for Cancer Prevention must call immediate attention, an urgent 911, to our polluted and sometimes cancer-causing drinking water. We as citizens need all resources shifted to this purpose — — to guarantee that (at the very least) our drinking water is safe. Having safe, clean water speaks to the most basic of human needs. It’s a no-brainer. And yet, this isn’t fully understood or appreciated in its urgency. It is precisely such concerns that called and continue to call on our work at Less Cancer. The Less Cancer work started when it was founded in 2004 under the name of Next Generation Choices Foundation. At the time the idea of cancer prevention was thought to be more of a crap shoot than the evidenced based science that more mainstream audiences now understand. Leading experts globally agree that over 50% of all cancers are preventable. Today we know that the evidenced based science indicates the best way to end cancer is to prevent it. Our goal with Less Cancer is to reduce all incidences of cancer — — particularly regarding populations with increasing rates of cancer. Current leadership suggests that any protections that would come with the legislation may soon be an effort of the past and that non- government organizations must work harder and smarter to garner support for work that assures safe drinking water for all. While individuals can help protect themselves with water testing and filters, organizations must fight for the policy and legislation that will help protect all Americans from cancers related to drinking water. This is a priority on which we all must be steadfastly focused. Remember when you didn’t think twice about using a drinking fountain? If we are to prioritize preventing any cancers, we must at the very least address the carcinogens in drinking water. This also requires we remain stealthily focused. It involves information, details, and action. While policy, legislation or regulation may not be a solution for every problem — -for the case of safe drinking water, it is the pressing priority. Personal action is not enough. Leadership from a government, non-government organizations and private entities must do all they can to provide creative solutions for ensuring that there will be safe drinking water for all. For agenda of there National Cancer Prevention Day Workshop, bios, speaker disclosures, instructions on claiming CE credit, and additional resources, please visit link. Viewers may claim CE credit by watching and completing an evaluation by March 3, 2017. Originally published at www.huffingtonpost.com on February 13, 2017.